Brother/Sisters : 3 sisters, Bibi Balbir Kaur, Bibi Randhir Kaur, Bibi Sukhwinder Kaur and 2 brothers, Bhai Sukhwinder Singh and Bhai Palwinder Singh. -attempted murder of Minister Manjinder Singh Bitta with a bomb. -attempted murder of BJP Minister Dr Baldev Parkash with a bomb. -killing of 3 Nihang Singh in Alhuwal. -killing of 3 BSF youth in Amritsar. -bomb explosion at Amritsar Railway Station. Bhai Sahib stopped the scooter just before he approached the police and with a Jaikara, Bhai Sahib shot his wife, and then took a Si-Nyde capsule himself. To break the handcuffs of slavery many warriors have taken birth. 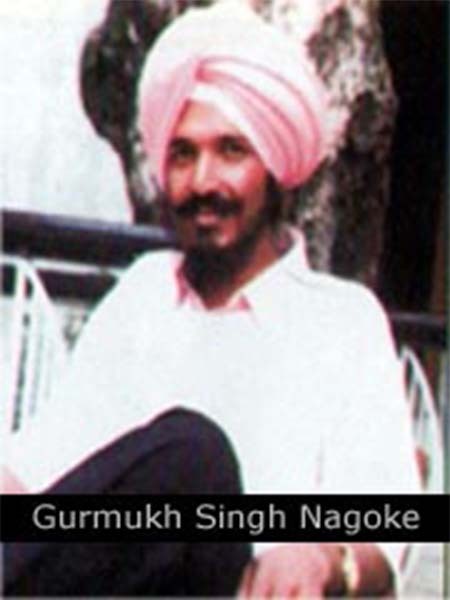 Nagoke a village near Khadur Sahib, where Bhai Bhala Ji told stories of Guru Nanak Dev Ji to Guru Angad Dev Ji, is the birth place of many Khadku Yodhe and one of them Khadkus is Shaheed Bhai Gurmukh Singh Nagoke. Bhai Sahib was born 27th May 1964 in the house of Sardar Ajit Singh and Mata Swaran Kaur in village Nagoke, District Amritsar. Bhai Sahib had 3 sisters, Bibi Balbir Kaur, Bibi Randhir Kaur, Bibi Sukhwinder Kaur and 2 brothers, Bhai Sukhwinder Singh and Bhai Palwinder Singh. Bhai Sahib studied at a local high school where he passed up until 10th class. Bhai Sahib got married in 1981 to Bibi Jatinder Kaur also known as Bibi Rajbir Kaur from village Tonng, District Gurdaspur. Dharam Yudh Morche & Attending the Speeches of Sant Bhindranwale. Bhai Sahib had attended many Dharam Yudh Morche and attended almost every lecture of Sant Jarnail Singh Ji Bindranwale at Amritsar. The views of Sant Ji had a deep impact on Bhai Sahib, after taking amrit from Sant Ji’s jatha, he became close to Sant Ji. Following Sant Ji’s orders, Bhai Sahib guarded Darbar Sahib at night and in the morning Bhai Sahib would catch the first bus back to Khadur Sahib. At Khadur Sahib, Bhai Sahib owned a shop of electrical goods. 2nd June 1984, Bhai Sahib was inside the complex of Sri Harimandir Sahib. Upon the order of Sant Ji, Bhai Sahib was made to leave the complex to fight another day. After the massacre of Darbar Sahib and during the killings oh Sikh youth by the Indian government, Bhai Sahib crossed borders into Pakistan. On Bhai Sahib’s return from Pakistan, Punjab Police arrested Bhai Sahib and many cases were thrown upon Bhai Sahib, and jailed at Amritsar. Bhai Sahib was released after 14 months, due to proven not guilty. After being freed Bhai Sahib found a job in Khadur Sahib at a milk plant as Field Officer. But the police did not give Bhai Sahib an easy life, the police harassed Bhai Sahib at the milk plant on daily basis. 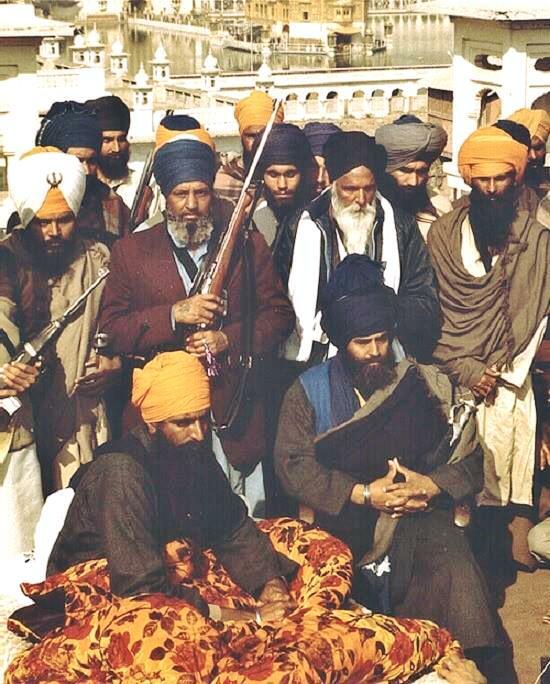 Bhai Sahib left work and joined the Khadku Singhs to fight a battle that was not over yet, Battle of Freedom. Bhai Sahib joined the group Bhai Kanwarjit Singh Sultanwind and Bhai Paramjit Singh Panjwar and together they did great sewa for the panth. The police did not stop their torture and harassment, if the police could get Bhai Sahib, they would arrest the family of Bhai Sahib. The family would spend months in jail and were harassed to give information on Bhai Sahib’s where about. Bhai Sahibs brothers always stayed away from home to avoid being arrested. The police had taken over the farms of Bhai Sahib and other assets. After endless harassment of Bhai Sahib’s father, Sardar Ajit Singh past away and left for heavenly abode. Whoever had sold themselves to the Indian government, at the time of Operation Black Thunder, 1988, would later be punished by Bhai Sahib. Bhai Sahib’s singhni, Bibi Rajbir Kaur had also joined her singh in this struggle for freedom. Bhai Sahib was against the innocent killings of Sikhs and the Sikhs who sold themselves to the government. According the Indian government Bhai Sahib was a terrorist and dangerous. On 2nd October 1992, DSP Vijay Kumar had deployed a small team of his police force at night to a bus station just outside Samrala. The police force was under orders to stop and search vehicles. At 3:45am a scooter was coming from the direction of Samrala. 2 men, a women and a 7-8 month old child were travelling on this scooter. The police signalled the scooter to stop, but instead the scooter turned into the bus station and entered a vacant room. As the police headed towards the room, AK47 and a revolver was continuously fired at the police. An encounter took place for 1 and a half hour. After no fire came from the room, police moved in. The police found 2 male Sikh bodies, 1 female Sikh body outside the room, and the baby was a 7-8 month old girl that had survived the encounter. Also, in the room an AK47 with 2 mags, a revolver, unlimited ammunition and 35 electrical detonators. The police had confirmed the identification of the 2 dead bodies, one of Bhai Gurmukh Singh also known as Bhai Sandeep Singh and another of Bibi Jatinder Kaur also known as Bibi Rajbir Kaur. Number of the Bajaj Scooter was PB11 597. Also Khalistan Commando Force letter pads were found. -killing of CRP Officers in Ferozpur. Looting of police weapons storage, where Bhai Sahib broke into weapons storage and took all the guns and ammunition. Many more killings were done which involved Bhai Sahib. A Singh from Bhai Sahib’s group had sold himself to the police and had become a Black Cat. The Black Cat rang the police asking the police to meet him at the bus station outside Samrala. On the scooter travelling towards the police from the Samrala direction was Bhai Gurmukh Singh Nagoke, Bibi Rajbir Kaur and their baby daughter, but there was no second male. Police had signalled the scooter to stop, but Bhai Sahib saw the Black Cat and knew that the Black Cat had sold himself to the police. Bhai Sahib realised that this was a set up with the help of the Black Cat. Bhai Sahib stopped the scooter just before he approached the police and with a Jaikara, Bhai Sahib shot his wife, and then took a Si-Nyde capsule himself. The police ran down to Bhai Sahib and tried to take the capsule out, but it was too late as Bhai Sahib had already swallowed the capsule. Bhai Sahib shot his wife because if she was arrested the police would have used her against Bhai Sahib and may have harassed her, as the police did in those days. Bhai Gurmukh Singh Nagoke and Bibi Rajbir Kaur attained shaheedi there on the spot and left this world to rest in the feet of Guru Gobind Singh Ji. After the police moved the dead bodies to the vacant room at the bus station and made a story of a fake encounter to realise to the world via media. The dead bodies of these Yodhe were shot with bullets, so that they would look like they have been in a battle or an encounter. After the fake encounter the daughter of Bhai Sahib was under the custody of the police. Bhai Sahib’s brother, Bhai Sukhwinder Singh took the sarpanch and many villagers to get the Daughter out of police custody. After the full investigation by the police was done the daughter of Bhai Sahib was handed over to Bhai Sukhwinder Singh.